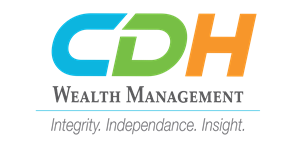 CDH Wealth Management is an independent financial services firm committed to the long-term financial success of its clients. We partner with individuals and families to design and implement customized investment, financial and wealth plans. We also work with businesses and not-for-profits to identify and implement strategies for their qualified plan (e.g. 401(k)) and investment needs. We encourage you to explore our site and learn more about our staff and the services we provide. Should you have any questions or would like more information on our firm, please feel free to email us or call us at 630-285-0215. We look forward to hearing from you.